Republic Ranches is a farm, ranch, and rural property brokerage firm serving Texas, Oklahoma, and via a strategic alliance with Fay Ranches, the Rocky Mountain West. 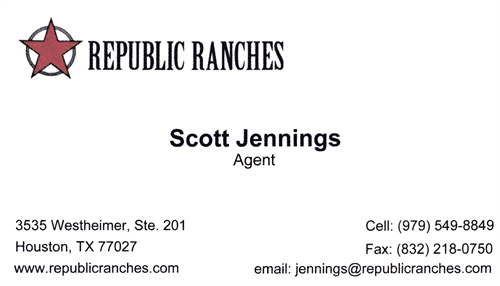 Republic Ranches is one of the most powerful land brokerages in the country. We have offices in Austin, Corpus Christi, Dallas, Hondo, Houston, and San Antonio. Our well-connected presence in the major cities gives us access to well qualified buyers. As a team, we bring a new level of professionalism, talent, dedication, and unwavering ethics on behalf of our clients. Scott is a native Texan who was raised in a small town south of Houston. He has been an avid outdoorsman and conservationist his entire life. He also owns and operates a small cattle operation in Brazoria and Real counties, and has extensive knowledge in developing and maintaining habitat for wildlife and livestock. Scott also has knowledge and experience in ranching, farming along the Texas gulf coast, and hunting property management throughout Texas. He is a member of the Texas Game Warden Association, Texas and Southwestern Cattle Raisers Association, and Ducks Unlimited. Scott received a bachelor’s of science degree from SWT in law-enforcement and agriculture, and lives in Brazoria County with his wife and daughter. His enjoyment and passion for the outdoors, conservation, and helping others, led him to join the Republic Ranches team.